The De Beauvoir Arms is one of our many incredible local pubs - it was something else when we moved to this neighborhood but I love the new incarnation. Sunny and bright inside, with plenty of outdoor picnic tables for good weather, it serves really satisfying pub grub and some small tapas style dishes as well, so I can always find something I want to eat. Great for vegetarians and pescetarians as well, which means we visit quite often with A's mum. The menu changes every day, so sometimes when you have something really nice it's sad to not be able to just order it again, but some things do repeat regularly. This picture is from a Sunday lunch with a group of eight adults, one baby. I had the spring chicken roast, while A went for the lamb - both were fabulous (I stole a bit of the cauliflower cheese that came with the lamb) and if you know me, you know how much I adore deconstructing small birds. It was perfectly cooked, full of chickeny juices and plenty of veg. 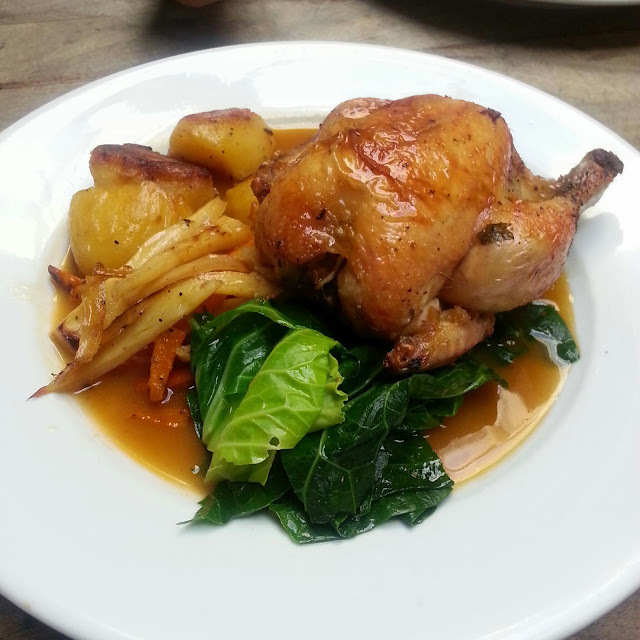 I usually don't have the patience to make Sunday roasts myself as there are a few too many components for a meal just for me and A - so it is great to know that aside from the Drapers, this pub around the corner can also satisfy all Sunday roast needs.